Jump into festive fall flavors with these gluten free and vegan sweet potato pumpkin fritters. Top with my hemp lime cream for a healthy side any time of day. It doesn't seem right talking about fall already. In sunny LA, we have warm weather well into September and October, and I suppose into January and February, and most months in between. So I really judge the change of season by the change of seasonal ingredients. I consider pumpkin to be a big fall staple, so I folded them into these sweet potato pumpkin fritters, for a vegan and gluten free treat. There's no sugar, eggs or grains in these fritters, so I think that means you can pretty much eat them any time of day. Throw an egg on top for breakfast. Pair it with a salad for lunch and/or put it under or beside your favorite protein for dinner. I've topped the fritters with my hemp lime cream and when I ran out, I mixed some fresh lime juice with coconut yogurt. That felt like a guilt-free dessert. The beauty of this recipe is that you can really get sweet potato and pumpkin any time of the year. So don't feel pressured to eat these every day in the month of October, though you may want to, as thye're a bit addicting. 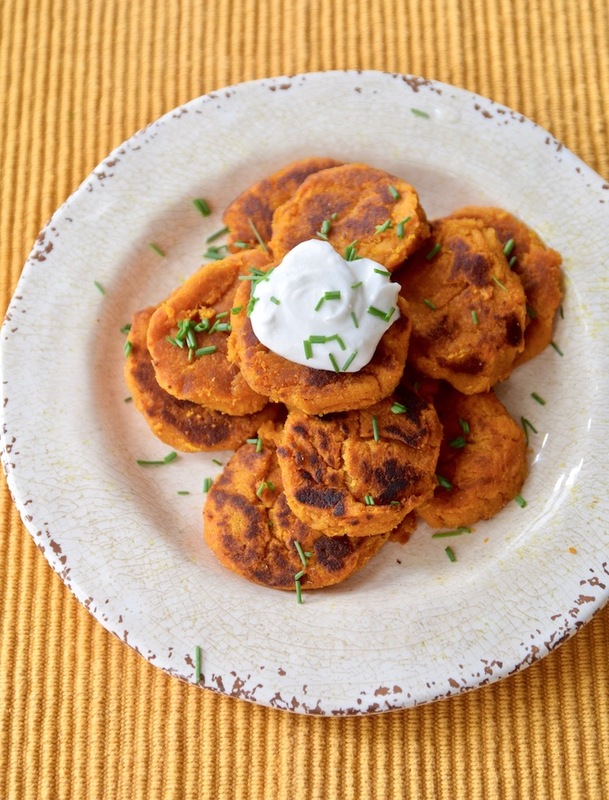 Enjoy the beginning of fall with these sweet potato pumpkin fritters. I steam my sweet potatoes in my Instant Pot. I scrub the sweet potatoes, slice them lengthwise and then place them face down on the Instant Pot trivet. Pour 1 cup of water on the bottom, cover, hit steam for 3 minutes and let the air release naturally. I let it cool and then scoop the flesh out into a bowl and discard the skin. If you don't have an Instant Pot, you can roast or steam your sweet potatoes on the stove until they're soft. Place the steamed sweet potatoes, pumpkin, coconut cream and spices in a large glass bowl and mix until combined. Gradually add the coconut flour to the mixture. It should be getting thick. Form small patties with your hand. If the patties aren't staying together, you can add more flour. In a large skillet, warm the coconut or avocado oil over medium heat. Once warm, add the sweet potato pumpkin fritters and top with salt. Don't crowd the pan. You want room to flip the fritters. Work in batches. Cook 5-10 minutes each side, or until golden brown. Once both sides are crisp, remove from pan. Top with my hemp lime cream or you can mix a little fresh lime juice with coconut yogurt. Looking for other Pumpkin Recipes? This post contains affiliate links, but clicking on them will not change the price of any item for you, but it will help offset the cost to run Tasting Page. Thank you for your support!